This is a very simple book. Simple text, no more than three paragraphs per page (every page has the background image) and every page is something you could take and pause with for a day. 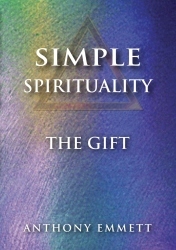 Life is a journey, and crafting your own simple spirituality is also a journey. Spirituality in some aspects is a matter of inner reflection. We reflect on our life’s experiences, and we take that word understanding and turn it around. That is, we take a particular experience, we stand under it, allow it to shed its light on us, and then we decide whether or not this choice, this behaviour, furthers our journey in life to peace, to truth, to love, to non-violence and to the arms of love. We build our own stock of wisdom and understanding. We live in an age of computers, laptops, tablets, ebook readers, smartphones and direction devices in our vehicles. Our world no longer requires that we write, that we pause for reflection, and the brains of young children acquire digital literacy and not reflection. We live in age of crowd sourcing, social networking with anonymity and social action without reflection before action. As our world is reflection, reaction, resound, we may end up entirely reacting to our environment instead of developing compassion and human understanding. 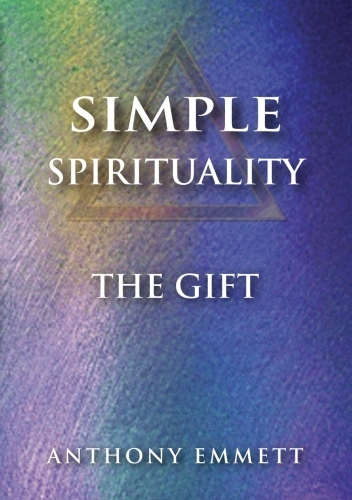 Thus, this little book on Simple Spirituality is important. Some books we read rewire the way we perceive. This world we live in is actually light; it is the force of maya – illusion – its very power which causes us to see, hear, touch, taste and feel the world we live in. Anthony Emmett goes into a simple explanation of how matter is energy and energy is matter, and how everything is a vibration of matter and energy. Here, Anthony Emmett, retired plastic surgeon turned sculptor, tells what the true nature of this world we live in is all about: the table we sit at, the doors, windows, the walls and roof of the home are all spinning particles of energy, energy vibrating. So also is the human person. The human person is a force in the Universe for Good and Love by the thoughts you put out into the cosmos around. As you clear out hatreds and anger, replacing jealousy with Love, the forgiveness you generate benefits your inner self and the health of your body. Tranquillity and happiness are generators of good health; your immune system works better, your heart and arteries benefit and you yourself are the main beneficiary. Each cell alive in the body responds to the climate of inner thought. The body will heal itself freed from the stress generated by the way of life we call civilised. Many of the gurus and great teachers call television poison. This is because television (televisham-poison) never gives out good news that gladdens the heart. It is all bad news. Service to others involves creating harmony between countries and religions. Armies should exist to serve all men, not to destroy countries we do not understand, writes Emmett. Emmett goes on to say, “Do not internalise the hatreds and fears that are out in the media and around. Rather, send them love by thought. Forgive them for their perceived mistake and wrap them in Love energy. This is the way of the 5th Dimension; nations and peoples in conflict and strife will sit down and discuss their different points of view and talk to an agreed conclusion. None shall even think to raise a weapon against the other – for this is the way of peace and love in the 5th Dimension. A simple, powerful book, one that carries materials for deep reflection; we may read a page a day, a paragraph a day, and seek to live this. As spirituality is what we practice, then we may arrive at self understanding and a true understanding of our world by the way of Simple Spirituality. Love is pure energy like a moonbeam. for in giving, we receive. is an exercise in learning. We learn best from contrast and opposites. from seeing its opposites in the world around. Express love as service to others. are the way forward in this world today.